Featured first is a new John Williams theme "Galaxy's Edge". The cool part though is they have lots of shots of the them park under construction. Looks pretty fantastic. Down the page are videos of two of the rides they will have. I'm not going to lie, if they made the Millennium Falcon into a hotel room I'd have to very strongly consider staying in it. Holy crap! That is fantastic. Ya crap. Now I know I'm going to have to go and stay in the legit hotel, and it is going to cost an arm and a leg. Imagine being a kid and getting to experience all that. "In brightest day, in blackest night / No evil shall escape my sight / Let those who worship evil's might / Beware my power, Green Lantern's light!" Hrmm interesting enough about that Galaxy's Edge Resistance ride.. possible spoiler for episode IX. 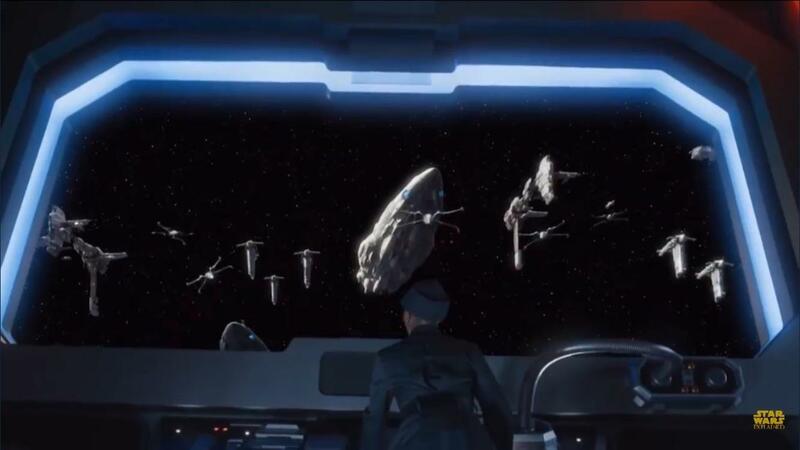 Apparently the Resistance ride takes place AFTER TLJ, so in this picture we see a full replenished Rebel fleet. Looks like the Resistance was able to build something up. There’s a rumour that the Obi-wan Kenobi movie is back in production and that George Lucas is actually attached to direct it. Very vague source though so take it with a grain of salt. If someone other than George writes the script, and as long as they don't let him run amok with the CGI, this could potentially work. I think it's more likely that British politician Boris Johnson has no idea that George Lucas sold the Star Wars franchise. After the prequels and the highly successful Indiana Jones: Aliens film I believe that the Screenwriter's Guild filed a restraining order prohibiting George Lucas from being anywhere within 500 yards of a camera. He cant even own a cellphone. I understand that his last trip to Disneyland with his grandkids was all kinds of grim, but we'll never have the photographic evidence to prove it. I can't even imagine how packed Disneyland and Walt Disney World's going to be once Galaxy's End opens. You can pretty much kiss visiting Disney Parks goodbye, tickets will surely rise to to $150 range. I can't even imagine how packed Disneyland and Walt Disney World's going to be once Galaxy's End opens. Yup, I expect it'll be a complete gong show for at least the first year it's open. I'd really like to go see it, but I might wait until 2020 or so. I'm down for a George Lucas Obi Wan film. This way we can compare and contrast the original creators ideas with the new stuff we've been getting (with many fans up in arms over how Disney is 'ruining' SW), and we can see what George would do now that he can implement the things he would've done differently on the last three after all the backlash over his creative choices then. Maybe he can trim down on things that didn't work and give us a dose of what we know to be and feels like the true essence of the originals, following the strongest character of the prequels who has the charisma to carry a standalone. Last edited by djsFlames; 11-26-2018 at 07:44 PM. There are rumors that Natalie Portman is filming a cameo in the next movie as she reprises the role of Padme. Set rumors show Kylo Ren walking on a metal bridge in a dark environment that might be the world between worlds as he goes back and witnesses Padme's death and funeral. Rumors that there is a flashback fight scene between Luke and Snoke. They killed off all the interesting characters so makes sense they have more flashbacks to inject more interesting content. I think most people would rather see stuff about the period between the OT and new trilogy than see where the story goes now. Those unanswered questions are more intriguing than "will Rey and Kylo elope or kill each other?" I just have this bad feeling that we'll get to the end and Rey and Kylo face each other at the end and they start fighting and suddenly a door slams open and an old man walks in and ignites his lightsaber and nods at Rey. "My name is Ezra Bridger" then he makes a gesture and a giant space whale falls on Kylo squashing him. Agreed. By now with episode 3 of this trilogy looming I should be bouncing around going "Oh boy! Oh boy! Oh boy!!" but instead I just don't really care. I just hope the focus stays on the story Abrams set out to tell from the start, and not on just trying to fix the other guys mistakes and/or teaching those internet trolls a lesson about Rose. But ya, some back story between Snoke, Luke and Kylo would be great, but to late. That should have came in Episode 8, should have been some reveal to hook us in and actually care about who Snoke is, or the relationship between him and Kylo. Instead when he died it was just like.. Ok. Cool. Glad hes dead I guess so I don't have to see him. Bah. The whole thing just has me bothered, but not caring at the same time. It is weird. I think I am more so just frustrated that i'm not more excited about a freaking Star Wars trilogy.